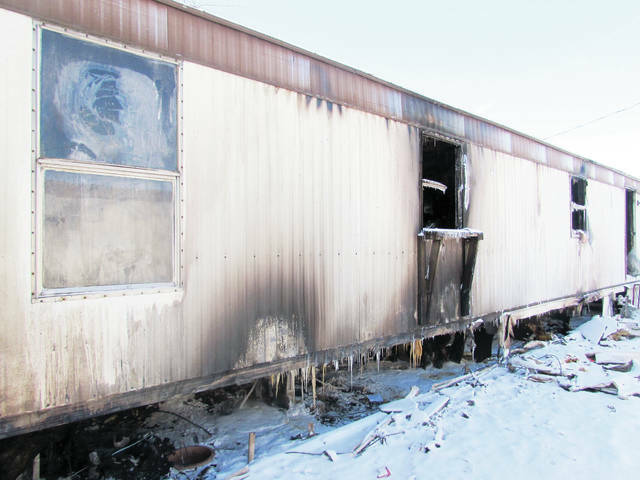 A residence in the Green Acres Mobile Home Park in Delta was gutted by fire during frigid weather last week. Fulton County firefighters faced the bone-chilling wrath of an icy weather system last week while battling both a mobile home fire in the Village of Delta and a house fire outside the village limits within two days. The raw, sub-zero temperatures and accompanying wind didn’t deter them from their duty. But fighting fires while enduring extreme elements can offer a unique set of challenges. A crew from the Delta Community Fire Department was dispatched Jan. 30 to Lot 32 at the Green Acres Mobile Home Park, 450 W. Main St., at 8:20 p.m., according to Chief Scott Smith. Firefighters arrived to find a mobile home with fire appearing in one window and heavy smoke engulfing the residence and billowing from its underside. Crews from the Wauseon and Lyons Royalton fire departments were called to assist in frigid temperatures that hovered at 10 degrees below zero. The blaze was brought under control about 10 p.m., although fire crews remained at the location for an additional hour to treat hot spots. The mobile home was declared a total loss. The owner, who the Fulton County Auditor’s Office lists as William Perry, and another occupant escaped without injury. An attempt was being made to thaw frozen water pipes under the home with a portable heater when the fire started. In an Expositor article published Jan. 31 (“Take extreme care in extreme cold”), Wauseon Fire Chief Rick Sluder warned residents against trying to thaw frozen pipes under mobile homes with portable heaters or with blowtorches or similar devices. Smith said the estimated 25 firefighters at the scene were hampered by the record-breaking polar vortex that settled over northwest Ohio for two days, bringing with it wind gusts and below zero conditions. Several of the firefighters fell on ice but none were injured, and none suffered from exposure. Delta fire crews were also sent to a blaze at 10:45 p.m. the next evening. Though the cause remains undetermined, flames erupted inside a wall of a two-story farmhouse at 9356 County Road HJ and were contained to a couple of rooms. The owner of the residence, Lee Grime, escaped without injury. The cost of damage has not been estimated. Delta firefighters were assisted by fire crews from Wauseon, Lyons, and Metamora, and Pike Township and the Ohio Department of Transportation crews salted surrounding roads for the firefighters’ protection. Smith recorded the temperature at the time at 3 degrees Fahrenheit. Sluder was among those who assisted at both fires. He said extreme cold presents challenges that sometimes can’t be met. Firefighters contend with ice building up inside hoses and equipment failures, as well as potentially dangerous falls on ice created by water spray. Extra manpower is staffed during extremely cold weather to allow for more frequent rest periods while fighting a fire. And more mutual aid is requested from area departments to ensure equipment remains available in the freezing conditions. Sluder said working in extreme heat is always preferable to extremely cold conditions, since fighting fires and taking breaks in the heat are less complicated. Smith said most of the crew members at the recent fires opted to remain in the bitter cold due to the unforeseen consequence of water freezing on their protective gear. He said the gear generally keeps the firefighters well-insulated against the cold, and the layer of ice that eventually covers the gear actually helps insulate them from the weather.